Discover is quickly becoming the most beloved credit card issuer out there because they’re so customer friendly. The ability to redeem any amount of cash back is awesome and unmatched! However, they also tend to be one of the most conservative credit card companies in terms of doling out credit card limits. For example, when I applied for the Discover it Miles card last year to take advantage of the Apple Pay promo and the double miles the first year deal, I only received a $5,000 credit line. Typically, I receive a credit limit north of $20,000 on my newly opened credit cards so it was a bit disappointing to receive a limit this low. It was also entirely expected. I wasn’t at all surprised because I knew Discover had a reputation for delivering low credit card limits. But it was semi-annoying in that I had to pay down my balance mid-statement to free up credit while going after that promo. I did still get the job done and walked away with about $1,600, but Discover didn’t make my life any easier with their paltry credit limit. The good news is that this issue can be easily fixed in a matter of seconds, literally. You’ll be directed to the page above where you simply need to enter your total annual gross income, your employer name (self if you’re self-employed), and your monthly housing or rental payment. 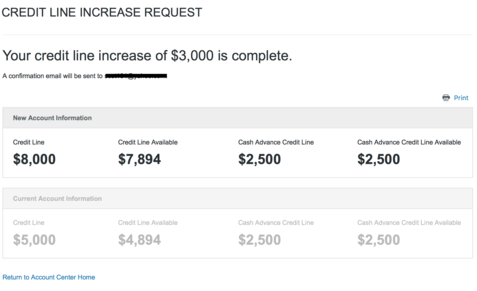 Once you fill in those fairly straightforward responses, you simply hit submit and within seconds your credit limit is increased. I Got a 60% Credit Limit Increase! I did this today and increased my credit limit from $5,000 to $8,000. Still pretty low overall, but I never get close to using my limit and it’s still a 60% increase. For the record, they don’t let you choose an amount. 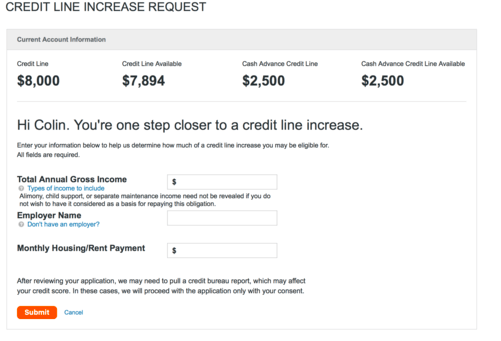 If you’re looking to boost their credit score in a hurry, this credit line increase should certainly help, especially if you’ve got a balance on your Discover card. It will help your credit utilization, which could be quite high seeing that Discover credit limits are so low. And as mentioned, it literally takes less than a minute to do it. I actually increased my regular Discover it card as well and it took me less than 30 seconds from start to finish. Yes, I timed it to be sure. So if you have multiple Discover cards you are able to increase the credit limits on both in the same day. Just be consistent in your answers to ensure a smooth process. And don’t expect a giant increase; similar to the opening credit limits, the increases are pretty conservative as well. But it’s better than nothing! Lastly, because these cards carry no annual fee, they can stay in your wallet for as long as you’d like, building positive credit history over time and helping to keep utilization ratios down. I just followed these instructions and got a 25% increase — $8800 to $11,000 — FICO 720 — been a member for 6 months and this is my 2nd increase. I just got my card when should I ask for an increase? Not sure if there’s a specific (or any) waiting period to ask for the increase.